Google's executive chairman is at it again, chatting up the next wave of "impressive" gadgets on the way from the search giant - without really divulging much in the way of details. 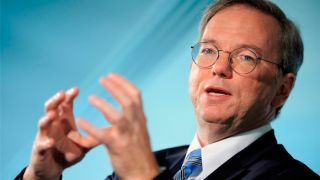 AllThingsD reported today that former Google CEO Eric Schmidt made a stop at the D: Dive Into Mobile conference in New York City, where he got chatty about a recent visit to the company's Motorola division. "They have a new set of products, which are phenomenal," the Google exec remarked. "Very, very impressive." Schmidt wouldn't elaborate further, except to refer to the upcoming devices as "phones-plus" - a futurist term we're sure will become a buzzword for Google and its manufacturing partners moving forward. New gadgets weren't the only thing the Google chairman was eager to talk about as the conversation inevitably turned to rumors of tension with Android partner Samsung. Describing the relationship between the two companies as "very healthy," Schmidt dismissed rumors that Samsung may be co-opting Google's mobile OS for its very own, as reported by Android Community. During a question-and-answer session after his talk, Schmidt commented that Samsung actually "helped to define Android" and how much Google appreciates the Korean manufacturer's decision to "go Android" while the platform was still in its infancy. And with good reason: Schmidt confirmed that Samsung is now the number one Android vendor by unit volume, which has now reached 1.5 million activations per day.